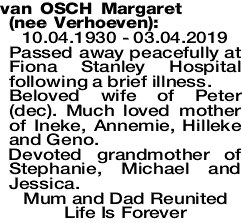 10.04.1930 - 03.04.2019 Passed away peacefully at Fiona Stanley Hospital following a brief illness. Beloved wife of Peter (dec). Much loved mother of Ineke, Annemie, Hilleke and Geno. Devoted grandmother of Stephanie, Michael and Jessica. The Funeral Mass for Mrs Margaret van Osch (nee Verhoeven) of Attadale will be celebrated in St Joseph Pignatelli Church, 18 Galloway St, ATTADALE commencing at 10.30am on FRIDAY (12.04.2019). Rosary prayers will be recited at our Funeral Home Chapel, 254 Hampton Rd, SOUTH FREMANTLE from 6.30pm on THURSDAY (11.4.2019). Margaret was an adornment to the Melville Cares Monday Friendship Group. Always a ready smile, willing engagement and great sense of devilment. Missed by the good friends she made there - including the Staff and Volunteers. 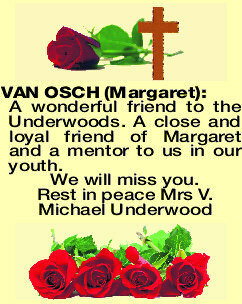 VAN OSCH MARGARET A wonderful friend to the Underwoods. 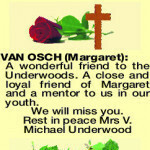 A close and loyal friend of Margaret and a mentor to us in our youth. Rest in peace Mrs V.